Before we release a list of all the winners for the 2017 Hermes Creative Awards, we’re showcasing select entries that stand out. Keep checking back to see if your work will be highlighted. Haven’t entered yet? There’s still time (until March 15). Stories are told in different ways in different mediums — from print to video to virtual reality to the web. As technology has evolved, so have the techniques. National Philanthropic Trust, which is dedicated to furthering philanthropy around the world, is in the forefront. 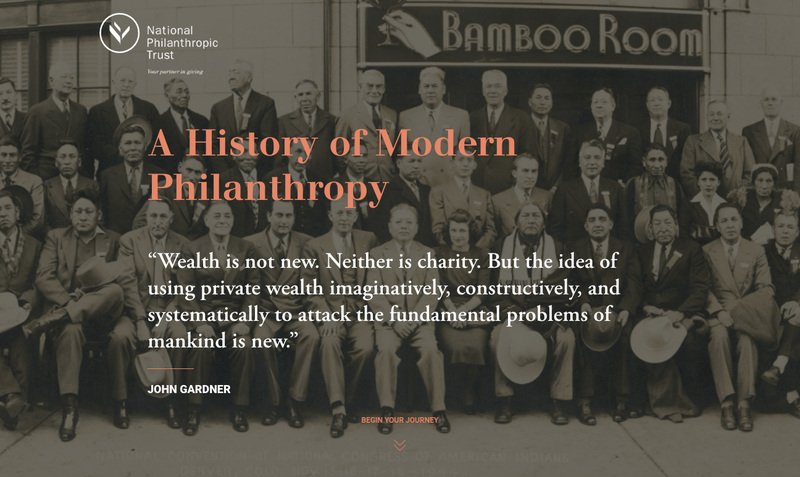 Combining cutting-edge technology with exceptionally skilled talent, the organization spent a year curating a digital exhibition named “History of Giving” to tell the story of philanthropy. Boring right? Not necessarily so. NPT dug deep for the research and presented the findings with artful graphics, easy-to-read maps and crisp writing.